Roughly 20,000 of the airline’s 46,000 global employees are women. The airline was also the first to employ female pilots and one of the first to train female engineers, the CEO said. Qatar Airways posted the apology to its Twitter account on Wednesday. 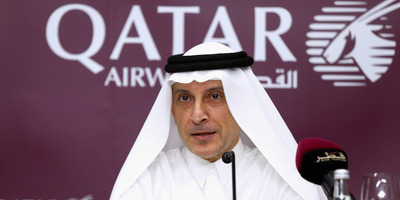 “I would like to offer my heartfelt apologies for any offence caused by my comment yesterday, which runs counter to my track record of expanding the role of women in leadership throughout the Qatar Airways Group and has been sensationalised by the media,” Akbar al Baker said in a statement. “Women comprise almost half (44%) of our workforce, and the dedication, drive, and skill they bring to their jobs tells me that no role is too tough for them, at all levels of the organisation,” he added. Roughly 20,000 of the airline’s 46,000 global employees are women. The airline was also the first to employ female pilots and one of the first to train female engineers, al Baker said, adding that several ranking positions within the company, including senior vice president, are held by women. Al Baker faced criticism for his comment made Tuesday at an International Air Transport Association (IATA) annual meeting in Sydney. The 56-year-old CEO told journalists that women were not being underrepresented at the airline, adding: “Of course it has to be led by a man, because it is a very challenging position,” he said, prompting boos from audience members. He later attempted to walk back his statement, claiming that he was “only referring to one individual” and that he would welcome a woman as his successor. Qatar’s flagship airline was ranked the top airline in the world by Skytrax in 2017, and has claimed top spots consistently over the last decade. The IATA, of which al Baker became chairman this week, only has one woman on its board of 26 people – Christine Ourmières-Widener, CEO of Britain’s Flybe carrier.